Camera panning blurs the boles of Quaking aspen (Populus tremuloides) in Wrangell – St. Elias National Park and Preserve, Alaska. Looking skyward, I saw the canopy of quivering leaves; ‘ahhhhh — those must be those Quaking Aspen trees I’ve heard about – what a perfectly named tree’. I settled back in to my bag, and enjoyed the comforting whisper. Quaking aspens quake because they have flattened leaf stalks, or petioles; these stalks catch the breeze and and twist and bend in the breeze. The theory behind this is that this by turning oblique angles to the sun, the higher leaves avoid harmful UV rays, and also allow more sunlight through to reach lower level leaves, enhancing photosynthesis rates. Maybe. I know it sounds pretty darn cool. There’s just a hint of snow on the ground in this shot, which helped smooth out the background. 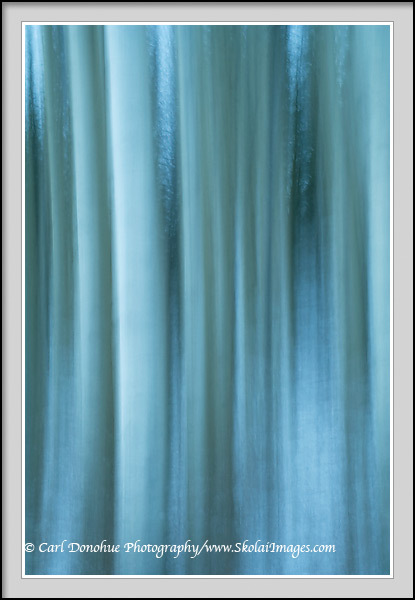 This entry was posted in Abstract Photos, Alaska, Fall, Forests, Musings, Wrangell - St. Elias National Park and tagged Populus tremuloides, Quaking aspens, Trees, Wrangell - St. Elias National Park and Preserve, Wrangell St. Elias on November 5, 2009 by Carl D.
I love this kind of stuff, Carl. I like this one even more than the first. The cool tones and lines are perfect! Thanks, man, I appreciate it.